And saying this, she would lament vehemently every once in a while. Though L.S.Lushai and I were never contemporaries, one look at his daughter Nonovi’s countenance and personality revealed that he was indeed one, whose memory deserved to be upheld in honour. Nonovi was a lovely damsel, in the prime of her youth, and had she been from any other family she would have quite been the talk of Aizawl town. Though she was the daughter of a poor widow, she was arrayed from head to toe in a prim and proper manner that was just enough to entice any young male visitor to the house. So much so that there were quite a few of us who wanted to hug or caress her especially after a few drinks. Yet she was not the type one could just fondle at a whim. She conveyed the impression that she disliked men, and this seemed to emanate from the fact that she had several suitors in waiting. And so she would flee from the ribald young men, and escape into the world of the written word in the confines of the bedroom. My name is Laldailova, people call me Daia, and most often even those who are younger or older than me, refer to me as “Pa Daia”. My father had once been a very successful businessman in the bazaars of Aizawl. Actually, if I were to disclose his name most of you would know who he was. We were three brothers, and all of us chose drink over business. After our father’s death we sold the store and wandered astray. My elder brothers died of alcohol abuse, and I alone remained. I was educated at Dawrpui School and was more interested in cowboy books, rather than my school text books. I was more caught up with Dusty Fog and bowie knife, and in the prime of my youth I was more interested in wearing jeans and riding in reconditioned jeeps and hunting with a knife. It was rewarding to capture an animal at hunt but it was equally marvelous to feast on a dog when we came back empty handed!! At first, I was merely a social drinker, and I would drink only in the company of friends. After a time it was the wine that became my friend. Shortly after, drink became my food, my life…in short it was my very bloodline. So much so that in my early twenties, my face bore the ravages of drink. I looked much older than I actually was. People often thought that I was over thirty, for my body was weak and I did not even feel the lure of young women. As such, rather than making an attempt at enticing Nonovi, I was more contented sitting by the hearth, next to Pi Pari, who in turn would regale me with tales of her youth. In fact on days when I was more excessively drunk I would simply sleep over. The other men who stepped inside that house simply regarded me as a regular inmate of the house, almost akin to a stray dog, and as I was small in stature, the young men would utter, “Where is Pa Daia? Turn the stools around he might be underneath” when I was not around. One night just as soon as I had entered Pi Pari had to attend to the death of a close relative in the vicinity, “Awi, awi, awi, he was my only brother, and as my father is no more, I shall have to be there. Pa Dai, you keep house. The wind is howling. But no one will come tonight, there isn’t any drink around.” Saying this she briskly wrapped her shawl around herself, and sauntered out. Nonovi and I sat down together. 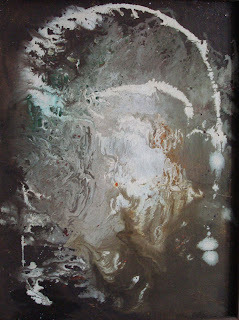 The wind began to blow furiously, and Nonovi sat close to me, I did not know whether I was afraid of Nonovi or the wind. I stood…Nonovi stood. To hide my embarrassment I closed the door…she followed me. I opened the door and went outside and brought in the chicken coop…Nonovi followed me outside. I took refuge under the dense jackfruit tree…Nonovi followed me still. We stood… face to face. The lightning flashed. Her countenance was radiant in that flash of lightning. Suddenly the power supply was switched off and amidst the lashing rain and wind, Nonovi embraced me. I then became a man. What transpired in the darkness and the wind and rain, under the immense thickness of the lush jackfruit tree, was something unknown to the entire world. Only the wind, the rain and the jackfruit tree knew. “I will decide for myself." I heard that in her despair she had found solace in the arms of another man. She had chosen wisely; for he was the wealthiest young man amongst her suitors. Later on, I learnt that they were married. Apart from that I heard nothing else. And truly speaking, apart from what I have narrated, I knew little else. My life was even more tumultuous than ever, and in retrospect I realized that it was the most horrible period of my life. I was drunk all the time. Yet I even married several times in the meanwhile, and my wives often left me for other men. Of course, when that occurred I would cast them out from the house, and take another wife. My family found me a muster roll job, which took me across several villages. In the meantime, I tried to live my life anew, but in vain, and I was even suspended due to my excessive drinking. I did not have a house in Aizawl anymore. All my relatives were dead, and so I wandered about aimlessly, I even sold zu* and was kicked out of my lodgings many times in the process. I had a daughter who lived with her mother. At length after a span of twenty years, I was back at Aizawl. I sold swine gathered from other villages. But even in my deepest drunken revelry, I never forgot Nonovi.She flashed across my mind’s eye at all times, and her countenance, amidst the wind across the jackfruit tree soothed me always. In times of joy or sorrow and despair I saw Nonovi’s face and I do not recall passing even one night without a glimpse of her visage. Why then did I shrug her away despite the intensity of my desire for her? Ah! It was simply because she was too good for the likes of me. While other men were possessed by spirits, I was possessed by Nonovi. Last evening we arrived from Champhai with a truck load of swine. The owner of the swine was a rich man from Champhai, and he would buy swine from the neighboring villages. He would bring these to Aizawl, every once in a while and my task was to guard the swine on the way. This was my tenth trip. It was not profitable, but it kept me busy and I drank less than usual, and I even began to feel that the company of swine suited me well. In fact I spent more time with the swine rather than with men, and I hardly had any friends. Last night was more hectic than other nights, for there was a pig that was being bullied by the others and so I stood amidst the swine at the back of the truck on order to ensure that no harm prevailed. Rain lashed about and I was caked with dirt amongst the droppings of swine. “They are mature adults; Rinmawia is unlike other young men of his age. He is one of our leaders at the Young Mizo Association; ironically, it was his mother who maimed his reputation”. Silence ensued, and I paid even more heed. I did not wish to listen anymore. Nonovi’s two children were standing behind the coffin, weeping copious tears of grief, with none to comfort them. The younger one was a lass of about sixteen, and it was as if she were endowed with the very same features as her mother. She reminded me of the time Nonovi and I first met and the memory of it made me tremble. Rinmawia, her brother, a young lad of about twenty made my hair stand on end. Even though, I was filthy from the ride, and though my body was gradually decaying, my eyes were quite alright. I could recognize my son Rinmawia, at first glance even from a distance. I wanted to go across and hug the weeping youth and claim him as my very own. But I glanced at myself and realized that I was filthy with the droppings of swine, and so I stood in utter disarray. I knew that if I stepped forward, I would be regarded as a lunatic, so I stood befuddled. I stood immobile and shivered violently. I glanced at the jackfruit tree again; for it was the only thing that was familiar to me…I would do according to its bidding. For even though it was on its last legs of life, it was still so profound. Why should I not reveal to Rinawma that he was my son? None of us were faithful…I was alive yet been ravaged by sin, Nonovi had been crushed to death by sin. Yet the accusing fingers pointed at us by society were not quite fair, for the path laid out for us by fate had indeed been tumultuous. And though we were considered akin to dirt, I felt that we were still quite clean. All this was not understood by the world, yet the jackfruit tree comprehended it fully. As proof of its empathy, it was still alive in spite of being shunted about by humanity. 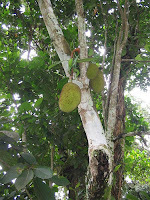 As long as the jackfruit tree was alive Rinmawia ought to know the truth. Let others think what they will, I would go ahead. The photo session was over and there were black clouds swirling in the sky above, and all at once lightning struck. A gust of wind blew from the east, and everyone rose in unison, even as the plastic sheets swiveled around. The jackfruit tree gave a great creak. I tried to run towards the coffin, while the crowd made an attempt to run towards my direction. We ran helter skelter, and I fell. A group of young men put the coffin in safer confines within the house and there were others who wanted to proceed with it towards the graveyard. Some argued about the absurdity of it all. Outside the rain whipped the plastic sheet and nearly pulled down the jackfruit tree in the process. Thundershowers arrived. A violent gust of wind swayed over once more and the world grew darker. Chaos prevailed. The wind blew the garments that hung within the jackfruit tree in wild disarray. The jackfruit tree tried its level best to muster up enough support to rise once again, and I was witness and supporter all at once. With the final thrashing of the plastic sheet it creaked violently, and amidst the streaks of lightning I saw Nonovi’s face…no…the jackfruit tree…it fell. I witnessed the end even as I myself came to a final halt. My son was no more. Wake up. Come forth, lightning, thunder, wind, rain, in horrifying deluge, bring on your bowl of curses together and pour it forth, I will bear them all. Heat your fires of hell all the more, add all your curses together, and shower them on me alone. I did not answer him… instead I delivered a devastating blow. I realized that it was the Dawrpui Church. I used to worship there when I was younger. I heard their laughter but it did not matter. Inside the Church a man stopped me and gazed at me in astonishment. He was silent and gazed at me for a long while. Towards the latter half of the Second World War, my father and I embarked on a journey, all on inter village footpath to Zotlang in the northern part of Mizoram to visit my ailing aunt. We set out from Aizawl and after four days we reached Hliappui, and from there we set off for Pawlrang. Zotlang was still a two hour journey from there. We broke journey at Pawlrang, where we stayed with our relatives.We shared an easy camaraderie, for whenever they came to Aizawl, they halted at our house and so we were good friends. They were an adult lot, who were quite well to do and actively involved in the Church as well. As their house was adjacent to the chief’s house, they shared close boundaries too. It was a big house and in typical Mizo fashion, there were prominent displays of the skulls, of the game that Pahanga, the head of family had shot. He was about fifty-six years of age, while his daughter Zami and I were about the same age. She was a petite young lady, with a glowing, albeit not very fair complexion and endowed with a slender figure. I had often taken her to the movies whenever she visited Aizawl and so we were well acquainted with each other. Secretly I had hoped that she would make such a suggestion. So I stuffed a packet of cigarettes and a box of matches down my sweater, while Zami donned a Naga shawl over her cardigan, and we got ready to go, but just before we left she advised “Rama, though a torch is of not much use in the “bak puk”¹ just take one for the sake of it,” and so I carried a torch. The famed “bak puk” was located at the northernmost tip of the village. As expected, great multitudes of bats hung about, clamouring for space and all around the stench was vile and putrid. The interior of the cave was very uneven, and this made us falter in our steps. Zami grabbed my elbow and clung to me, and as I tottered, my hands brushed against her breasts and made me tremble, and it gave me a tingling sensation in the process. Gradually, the darkness and the stench grew unbearable, and we fled outside, and as we did so, bats flew about us in wild abandon. We stood by the edge of the cave, inhaling the fresh air. Gazing round I could detect a small lake famed in a way, as Bak lui² some distance away. Ensconced on its banks were beautiful strips of undulating virgin forests and meadows. Two or three old hamlets and barracks made of bamboo and straw stood there in tranquility, bereft of occupants. Dusk fell gradually and the area was exceedingly quiet, save for the croaking of the toads and the chirping of the birds. I laughed “Let’s go there awhile… the meadow looks very serene and tranquil”. Saying this, I took hold of her arm and as she did not protest we soon reached the meadow. My heart was gay and pounding with excitement for the atmosphere was pure and quiet, the moon shone luminously in the sky and all was still. A dreamlike stupor shielded the area. Four barracks and two mess halls stood in the distance, while the interiors were still in sound condition, the doors and the windows were in sordid state and the bunk beds let out a musty odour. Mice darted about our feet as we approached, and Zami waited outside while I explored the oldest and the largest of the barracks. She sat atop a solitary log, in front of the barracks. I went and sat very close to her and mustering courage as a young hesitant boy, I placed my hand upon her shoulder gently and said. “No, not really, we usually go towards Hliappui road,” saying this she softly brushed my hand away in a way that made me quite happy. “What shall I do now?” I pondered.In the distance I could discern the approaching figure of a man in olive green and well worn boots… the uniform of the Assam Rifles soldiers… Looking work worn and quite unkempt he came downhill. We were a bit abashed and we moved apart and though we were not scared, we were slightly apprehensive and my hair stood on end. Zami grabbed hold of my hand tightly. And in that interminable twilight zone he said in heavy Nepali accented Mizo. Saying this he placed a gold necklace in my hand, weighing about two tolas. Trembling I accepted it, and he turned back without another word. “Hey Sir, What is your name? Who is the woman in Sherman Tilla³ ?” I cried. He glanced back. “My name is Naik Havaldar Gurung Thapa.. my friend’s wife stays at Sherman Tilla… war is not good... my friend died in the Chin Hills battle.. please give it to her” Saying this he walked inside swiftly. I placed the gold necklace inside my jacket pocket. Zami was a bit scared and she tightened her hold upon me. "What’s the matter? There is nothing to fear…” I placated her. “Life is so cheap in the battle Field” 1st A.R. A shiver ran down my spine as we headed for home. Odd was it not? It was that very soldier’s tombstone. In a daze, I followed Zami and both of us hurried ahead, not even stopping to admire the beauty of “bak puk” or the “bak lui”. After three weeks we were back to Aizawl. “What shall I do with this golden necklace… should I keep it for myself or should I seek out the woman at Sherman Tilla?” I pondered. Eventually one evening along with my friend, a student of class ten at the Government High School I headed for Sherman Tilla. It was an inconspicuous area, that was resplendent with hills and meadows. It however was the right ambience for the Gurkhali ladies who dwelt there. Narrow inroads as well as crops planted in wild abandon created the impression of a forest. As I said before, it was obscure yet very pleasant. We wandered about in vain. But after a considerable while we came into contact with a woman who stayed in a far-flung place towards the mandir. Attired as she was in the typical Nepali fashion, she presented an attractive sight, adorned with earrings necklaces and colorful skirts. She was much older than us, and as she laughed we could see flashes of her gold capped tooth. Ah! had she been younger she would have enticed us even further! As we sat in the verandah, she narrated a tale that was both interesting and sentimental and straight out of the Hindi movies. I was struck by the profundity of it all!How glorious the 1st AR battalion had been! How precious their sacrifice! How selfless their devotion! Still enraptured, we went in search of Gurung Thapa’s wife, who, we were told stayed at Dawrpui Vengthlang. All this while the gold necklace was still firmly in my pocket. Gurung Thapa’s friend, the one who had entrusted him with the gold necklace, was a Mizo. He had died in action during the Chin Hills battle. Gurung Thapa had risked his life to give his dying friend a decent burial and his friend had entrusted the gold necklace to him. “Friend.. here… give this to my wife.. purchased from Imphal… give it to her...” he pleaded with his last breath. Gurung Thapa laid his friend to rest in the old Japanese trenches. It was a secluded area and the giant trees bore the imprints of bullets, amidst the rhododendron that bloomed in plenty. As for Thapa no one knew how he died, and strangely enough only the tombstone at Pawlrang conveyed the fact that he had died in action. I caressed the gold necklace in my pocket, a grim remainder of the workings of fate. The woman in question was very difficult to locate, and we blindly groped our way through. As we reached Dawrpui Vengthlang, its original in habitants offered some help. “Perhaps it’s that lady in that rented house over there. She is a lonely widow with two children. Of course, we hardly see her nowadays”. Another woman offered “Just a while back I saw a woman along with her two sons, carrying her “em”4 behind her. She said she was going to stay with her brother at Zokhawsang and was headed towards the Dawrpui graveyard. Perhaps it was her. Zokhawsang was only four miles from Aizawl. As we caught up with each other there, nostalgia and sentiment enshrouded us. The lady unfolded a touchingly haunting tale laced with nostalgia, sorrow, bizarre and frightening emotions... and inexplicable indeed was the fact that her husband’s soul still occasionally visited her. 4 em: traditional Mizo woven basket. Thanseia was the first District Education Officer in Mizoram. He later retired as Joint Director of Education in Mizoram. Margaret L.Pachuau translates from Mizo to English.A doctorate in English from Jawaharlal Nehru University New Delhi,she teaches at the Department of English,Mizoram University. Ignoring the problem will not make it go away. The sudden bullet in the head. Thus she sits, calmly gathered. and left it in a jar on a hospital shelf. That was when the drums began. in every corner until the police chased her down. She jumped into a taxi. and it was the dog who died. Such is life. or the cicada crumbling to a pair of wings at her feet. is kidnapped by demons and the young wither without complaint. by short men with a Bible and five big knuckles on their righteous hands. Religion has made drunks of us all. The old goat bleats. We are killing ourselves. I like an incestuous land. Stars, be silent. with a look of terror too real to be comical. We have been bombed silly out of our minds. Waiter, bring me something cold and hard to drink. and someday I will walk into it. in an uncommon criminal act. In the red earth lay her like a seed. Mona Zote is in government service at Aizawl, Mizoram. She writes poetry in English. Some of her poems have been included in the IIC Journal, winter issue 2006, the Indian Literature Journal, June 2006, and the Anthology of North East Poetry published by NEHU, Shillong. We'd love to see a complete collection of her poetry in print soon. I was standing in front of my house one evening when I was called aside and suddenly dragged into a waiting vehicle. Firmly blocking all exits, three of the men started pounding me heavily inside the moving vehicle. The reason? According to my tormentors, this was my punishment for speaking out against a certain person’s corrupt practices. Unlike others who can either keep mum or speak in more respectable tones, I had opened my mouth – in a local bar, of all places. Someone had warned, “Do keep quiet,” but I had arrogantly continued my foolish tirade and brought my present predicament upon myself. My pleas for mercy only resulted in an increased show of strength. After some more of this beating, I was thrown out of the running vehicle on the outskirts of Aizawl and left for dead. I was in my prime, thirty years old, with a wife and children, and my health had always been sound. Hence I had never believed that a death blow would come as easily to the likes of me. But when I heard my hipbones crack as they hit against the pointed corner of the stone pavement and darkness started enveloping my consciousness, I knew that I would never be the same. To talk about such matters is irksome for me. Neither is my being alive today the reason that prompts me to do so. In fact I fear that what I have to say might offend. But after that night – six months to the day today – when a passing vehicle picked up what they thought was a dead body, something very extraordinary took place in my life…which is why I have to bring up the past again. The morning after my misadventure, my name, spelt incorrectly, appeared for the first time in my life in the newspapers in Aizawl. The relatives of my abductors turned up in full strength by my bedside, for a pseudo display of heartfelt pity and compassion, wiping their crocodile tears with my red hospital blanket. The eatables they brought along were exotic and unfamiliar while the huge amount of money they gave for the treatment was a secret. Some of them even threw in faith healers and spirituals in the bargain. They were certainly a sight to behold – though protesting that they were not worthy of absolution, they continued to plead forgiveness. Even before I was in any fit state to forgive those who had nearly killed me, their families had already announced to the papers that I, a good Christian, had forgiven them. It must be true, for I am one of those who spend a month’s salary on drinks alone, one whom religious counselors see as “evil incarnate.” In my full senses I don’t recall forgiving anybody, unless, when lying half-dead by the roadside and well on my way to hell, I had metamorphosed into such a good Christian that I had perhaps forgiven my tormentors in a delirium. Unless such a thing had taken place, I don’t ever recall being a good Christian. But their emissaries politely said, ”…they’re moneyed and you’ll never beat them in court. Therefore, forgive them while they ask for it. Besides, they intend to give you a large sum of money as well. Don’t you think this will be better for your wife and children?” Of course no one said outright, “You’ll be beaten black and blue if you don’t comply.” But I felt the implied threat nonetheless and so magnanimously gave my pardon. So here I was, now a renowned “true Christian” who gave the other cheek even to those who hit him, still lying on the hospital bed and hoping for a cure. A month passed by thus and the doctors started losing hope of my recovery. So with the money earned by my noble act, I proceeded to bigger hospitals outside the state, but everywhere I went, the answer was the same, “You are too late.” Determined to walk again, I shopped for every specialist I knew. And when I ran out of money, my wife Muani sent what I needed, though I did not know from where she procured the sum. But when that money too petered out, I finally realized that I was destined to spend the rest of my life in a wheelchair, never to stand or walk again. As I read the letter I thought what a burden I had become for my family. Even if I returned, there was no hope for me in Aizawl. But the urge to set eyes on those who loved me – my wife and children – once again, and the desire to be buried in our local cemetery were motivation enough to lead me back to Aizawl. So I came home. One person took me out from the taxi and another carried what was to be my lifelong throne – my wheelchair. Two other persons carried me down the steep flight of steps leading from the road higher up on the hill slope to the ground floor. Aware that I would never see Aizawl and its beauty again, I longingly and regretfully drank in the sights. Dark and cramped, our house didn’t offer much of a scenery. Inside, I sank back into my wheelchair. Muani put her arms around me while my two sons looked on, puzzled. Then the elder one spoke up, “Ka pa, can it run around?” while the younger one piped in, “Ka pa, get up, I want to try it out.” The future of our little family was something I couldn’t bring myself to ponder upon at that moment. I got more visitors than I had bargained for. They wanted to know badly I had fared in the plains, whether the orthopaedic specialists were really good or not and whether I had given up the bottle. Then there were those, of course, who simply wanted to see me. They all came and closed ranks around me with pseudo compassion. And each time they prayed, I wondered why no one mentioned the milk I drank, but only chose to sermonize about my alcoholism and about the harsher trials that awaited me if I didn’t reform. The more they came, the more suffocated and depressed I felt. They were others who tried to gain political mileage out of my misfortune by using me a lever to topple what they called a “corrupt government.” The weekly papers carried reports of the number of threat letters I supposedly received. Had it been possible, I might have left for good the Mizoram that I had come home to with such difficulty. But the passing of time brought on other news and other headlines more sensational than mine, and very soon, the vultures left to seek more interesting fields. Their sudden concern barely lasted three months, and by the fourth, the only people who knew I existed were my wife and children. My younger son fell in love with my wheelchair. Unable to have it, he started demanding a new cycle, but we couldn’t afford that either. We tried to repair his old one to make it look like new, but the efforts only made it worse. The front label on his cycle which proudly proclaimed “Thunderbird” fell off and he started crying. It was only when I said, “Wait Valte, don’t worry. I’ll stick the label onto my wheelchair and the day I get well, you may have it,” that he finally stopped crying. From then on my wheelchair was officially christened “Thunderbird”. My daily routine was simple. At sunrise, my wife would help me sit up on my bed and place me on Thunderbird. Then my children would push me around. The younger one would ask, “Ka pa, you will get well tomorrow and I will be able to sit on Thunderbird, won’t I?” Sometimes I would answer “Yes”, sometimes “No”. What difference did it make? There wasn’t even scope for privacy in the toilet. I had no choice but to submit to the humiliating ministrations of my family. Even a dog, I thought, must have more use for its family than I.
Muani proved a good wife and took care of my needs without complaint, while my children still held me very dear. Muani’s salary took care of our needs and our two children were able to continue school. Each morning she would lead them by the hand out of the house and drop them off to school on the way to office. I would wheel myself up to the front door to see them off. From the top of the steps they would wave and call out, “Ka pa, bye bye” and I would wave in return, gazing at them until they were out of sight. Then with tears in my eyes and a heavy heart, I would turn back to the room, to be by myself for the rest of the day. It was during these lonely times that the realization of just how useless I was and how hopeless and bleak my future was would hit me all the more. Every day I thought, “Today I will hang myself.” But the memory of my children waving at me and calling, “Ka pa, bye bye” would always stop me. My deep desire to see their faces once more when they returned home in the evening was what kept me alive. Trying to keep myself happy and occupied, I read books with a vengeance and tutored myself to listen to music, forcing myself to find ways in which to enjoy it. I would fashion bamboo slivers into toothpicks and little pins to clip the betel nut preparation together. Sometimes I would sketch, and at other times make the arched framework for the children’s kites. Thus I passed my days. But for one who had nothing to look forward to, the effort to be happy while remaing confined to a wheelchair the whole day was indeed a tedious one. The creator made a separate timekeeper for the dead, and another for the living, but for me who was neither dead nor alive, there seemed to be no yardstick with which to measure my time. In reality, I belonged to neither world – for though I lived in the world of the living, I could not partake of it fully. The daily news began to bore me because it no longer had any meaning or impact on my life. Songs began to annoy me for they spoke of a world I could not reach. All other sounds irritated me as well. Nothing that issues from man is worth close scrutiny when one has to sit the whole day in contemplation of it. And so, with the greatest of efforts I opened a window and turning my back on all manmade efforts to keep me happy, looked out, my face towards the sky…not knowing what to expect, yet knowing that I secretly did expect something. There was nothing to see. Since the house was sandwiched between concrete buildings, the only sight that was of some interest was that of the Zemabawk locality some distance away. A sickly looking mango tree grew on the slop below the house, one of its upper branches almost reaching our window. Beyond this there was nothing else but the blues sky. Counting the number of vehicles that entered Zemabawk was a convenient way to pass time. But to do this every day became much too trivial an occupation and soon I sought other ways to keep my mind busy. I observed carefully the nature of the caterpillars that steadily devoured the tender leaves of the mango tree below, then gazed at the gardens situated between Zemabawk and the Chite rivulet. This too bored me eventually and in despair, I again turned my face up to the silent blue sky. Three martins flew by and went out of sight. When they returned they started flying in small circles within my range of vision. A fourth joined them. Softly calling out to each other, they flew high up into the sky playfully, then swooped down swiftly again without any fear. Just when I thought they would collide midair, they would skillfully and speedily manoeuvre and pass each other. Seemingly carefree and without a burden, the freedom they owned was one that was inexplicable to humans. I shouted at the top of my voice, “Fly away at once!” As though in compliance with my wish, they would be gone for a while and then return, infuriating me all the more. Scolding them was in vain. I had no catapult with me either, and when I tried closing my eyes, the sound of their soft calls sounded in my ears even more. When they flew close by, I would stick out my tongue at them but of course, to no avail. One morning as I sat by my window, gazing up at the sky, the martins failed to appear as before. Perhaps my scolding had made them feel restrained and ill at ease. Their disappearance made me feel surprisingly lonely. I missed their presence and looking up at the blue sky, I waited for them to reappear. I thought of my life and I realized that ever since I started occupying myself with the martins, not once did the thought of taking my life ever occur to me. I now understood. I had been cursing the best friends that I had. The next morning I sat waiting expectantly for them again, and sure enough the martins appeared at the usual time. “Oh you martins who are so pure of heart, I will never scold you again. Come closer and let’s discuss Siamkima’s Zalenna Ram and Keivawm’s Zoram Khawvel,” I jokingly called out to them. I felt as if my poor, heavy heart was eased of its burdens. The martins too appeared to be more excited than ever, their play and behaviour unduly pronounced and exaggerated. I teased them loudly about this and they laughed in reply. I grew to learn their likes and dislikes and came to believe that they too learned to read my mind. They were ready to do anything to make me happy, and as we grew closer I confided all my problems to them. Sometimes they flew me and my Thunderbird high in the sky, and we would explore the length and breadth of Aizawl, looking at all that I wished to see. Had I felt up to it, I know they would have taken me on a tour around the world. Every day I would fly with them, their small wings holding me up. The martins taught me freedom, and showed me how to be carefree. I grew to know each one of them individually and they never tired of what I had to say. But because of them I began to look forward to each new day. But the more I ventured into this deep relationship with the martins, the more I withdrew from human beings, speaking very little to them. Muani began to worry, but as she understood how miserable my life was now, she let me be. The hopeful pleas of my younger son, “Ka pa, can you get up? I want to sit on Thunderbird,” grew louder in my ear day after day while my condition, instead of improving, deteriorated with each passing day. With each passing of time – a month, a day, the batting of an eye was over in the ticking of a clock. But for me, noon and night dragged on and time was in no hurry whatsoever. I became more and more of a stranger to the rest of the world. I stopped talking to people altogether. But the martins and sparrows became more intimate, drawing me closer to them. As the seasons changed, so did the birds. The martins disappeared and five months after my accident, the only bird that stayed back to be my companion was the humblest of the lot – the sparrow. A few days back, after my family had left for the day, I opened the window to gaze out as was now my habit. Out of the flock, I had a favourite – a little sparrow which would immediately come near me to perch on the window curtain rod. Like a doctor examining his patient, the bird inclined its head and first carefully observed me, then my Thunderbird. Chirping loudly as though conveying something, it then hopped about on the mango tree below. I realized that the sparrow intended to build its nest on the most inconvenient spot, the branch that was closest to me. 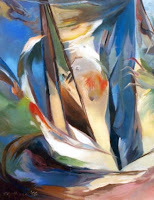 The sparrow would fly off, come back with a twig in its beak, tuck it very carefully in to the nest and then fly off swiftly again in search of more. Collecting dry leaves, broom twigs, random pieces of cotton wool and so on, it would arrange them together as best as it could. The result was the semblance of a nest that was unsteady and obviously not strong enough to withstand a gust of wind. Thus the day ended. I could hardly sleep that night as plans for building the nest filled my mind. Both of us were busy again the next day and by evening, the nest was finally complete. But it was not firm. When the sparrow tested it, the nest almost dislocated from its perch. It needed more props and support for balance. Today too, as soon as my family left home, I resumed my vigil. When I opened the window the bird was already busy at work, trying to strengthen its nest. After a while, it flew off into the distance and did not return for a long while. I wondered what it would bring home this time. It soon returned, a twig in its beak, flying unsteadily under the weight, and then tried to place the twig between the fork of the branch that held its nest. Had it succeeded, the twig would have firmly held the nest in place. But no matter how careful it was, the twig fell. The little sparrow retrieved it from the ground, perched on my windowsill, flew back to its nest and again tried to place the twig in the same place It fell again. The sparrow retrieved it again, and the cycle continued for at least ten times, with no success. And each time it picked up the twig, the little bird would approach me with it in its beak. The whole thing started affecting me in a strange way. This little bird was trying to teach me something. If it dared to attempt the impossible, why should I still be sitting? All right, I suddenly thought, even if I fail I must at least make ten attempts to stand up. Excruciating pain racked my lumbar region. I was drenched in sweat. The immediate thought that came to mind was that I had done something I was not supposed to do. Had there been anyone nearby I would have been told, don’t, you’ll aggravate your condition. But my only witness was the humble little sparrow perched before me, unbudging, watching. Again, I held the armrests of my wheelchair with my hands and tried to push myself up. Breathing heavily from the exertion I managed to lift my hips up from the chair. As I tried to support myself on my feeble legs my hipbones felt like they were being pierced with a dagger – so great was the pain. My legs experienced pins and needles, and I shivered out of sheer fatigue. As my strength could no longer sustain me I slumped back despairingly into my chair. But the bird was still waiting, twig in beak, challenging me. Breathlessly, I tried to chase it away, “Go, don’t wait for me. I just can’t do it.” But it refused to budge and kept looking at me as though spurring me on for another attempt. Apprehensively, I tried to stand again, and this time my body protested even more than before. I moaned aliud in pain, but steadfastly kept my eyes on the sparrow fearing I might not succeed if I shifted my attention elsewhere. I garnered my full strength once more, and despite the pain, forced myself to stand again on my feet. I had thought I would never stand again, hence I was so excited that there was no time to despair or faint. I would go through this terrible ordeal. Instead of being wheelchair bound and alive, I would much prefer dying on my feet, I thought, and again made several attempts until I finally stood up awkwardly, holding on to the windowsill for support. I was giddy with the intense pain and my vision clouded so much that I could not see clearly the sparrow before me. But I stood! I was no longer seated on Thunderbird! How strange it was. I was not sure whether the tears that trickled down my face were tears of pain or of happiness. Were the sounds emanating from my throat that of pain or of laughter? I didn’t know. Yet, I stood! I recalled how I had been thrown out of the vehicle, and recalled too the sound of my hipbones breaking as I hit the parapet, and now, standing with only the sparrow for an audience, I wondered whether I was dreaming it all. Enthusiastic as I was, my strength could not sustain me long. I dropped back on Thunderbird. The sparrow meanwhile flew off with the twig and again tried to support the nest with it. But a gust of wind blew at that moment and down it fell once more. Seemingly in despair this time, the sparrow gazed down from its perch at the fallen twig but eventually flew down to retrieve it. Having done this it again came and perched before me. It willed me to indulge in my crazy attempt oonce more. My mind was filled with despair and dread. Even if I did stand I wouldn’t be able to do so for long. Afraid to make another attempt, I thought maybe I should rest now and perhaps try tomorrow. But the sparrow compelled me, so despite my fear I took a deep breath and tried again. The pain seemed to increase with each renewed attempt. But when I did stand up with all my strength behind me, it eased a bit and I could stand for a longer period. Even when I did sit down again, it was slow and deliberate, not sudden and heavy like before. 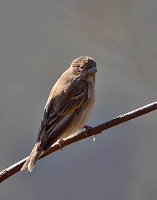 The sparrow too flew to its nest with the twig and this time, succeeded in placing it on the fork of the branch, making its home as firm and steady as it had desired. How overjoyed we both were! In order to prove that this wondrous event of my life was a reality and not a dream, I had to prove it, not to the sparrow but to my fellow men. Although I looked forward to Muani and the children’s homecoming, I was afraid to believe that I would be able to really stand before them. To prove that it was a reality I somehow repeatedly made myself stand up and despite my fatique, managed to successfully stand up on my own six times. Evening came and my family returned home. I was aware that no matter how convincingly I told them of my achievement, they would not believe me. I had to make them see the real thing. Weak as I was, I secretly took a deep breath and gathered all my strength. I knew that I would be able to do it. “Muani, Mama, come here,” I called. They all left whatever they were doing and came to me, surprise writ large on their faces. “I can stand up!” I announced, straining myself. They were at a loss for a reply. Muani thought I had gone out of my mind, so with tears in her eyes she put her arms around me and tenderly caressed my forhead. I was a sight to behold as I prepared myself physically and mentally to stand up once again. As I exclaimed, “Now then!” I tightly gripped the armrest of Thunderbird with all my might and determinedly pushed myself up, arranging my weak legs as best as I could, oone hand on the windowsill. Muani put her hands under my arm and tried to help me, but I shouted, “Don’t touch me!” I focused my eyes on the nest outside my window. My pain now seemed to multiply tenfold when compared with what I had suffered before, and I felt darkness clouding over me, but I was almost standing. That terrible second was overcome and I stood as before, holding on to the windowsill. Praise be to the sparrow! My wife cried as she held me, trembling with surprise and shock. My older son leapt up and down. “Ka pa… Ka pa… he stood… he stood!” he shoutedly loudly to the world outside. The younger one said calmly, “There! You said you could not get up, but you did!” and immediately started riding Thunderbird around like a cycle. “I don’t know, Mama…” I was silent for a long while. Vanneihtluanga has written several short stories, plays, articles and essays. Keimah Leh Keimah and Neihfaka Rilbawm are collections of his creative writings as well as autobiographical pieces which are both humourous and thought provoking. Besides being a social worker and critic, he is also a successful entrepreneur, being owner and editor of Lengzem, a monthly magazine on popular culture, and joint owner of the Mizo television network Zonet. Margaret Chalthantluangi Zama is a teacher by profession, working in the English department at Mizoram University. Besides translating from Mizo to English, she has also written a short story, Zoey, and some unpublished poems. She has been an active social worker closely associated with disabled children and their parents in Mizoram. Dr. Zama’s translated piece reproduced here was published in 2004 in The Heart of the Matter. Thunderbird was first published in Mizo as Thunderbird in Khuarel magazine in 1992.